Click the Rocket Polluter Game picture to create your own Rocket Polluter style games or play Rocket Polluter style games others have already made. 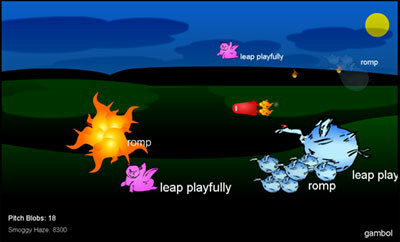 In Rocket Polluter style games the player controls a pitch blob firing rocket and launches flaming pitch blobs to pollute the world as much as possible in the shortest time. Create your own Rocket Polluter style game just by pointing and clicking to make your own unique game - and have it shared instantly so you and your friends can play it immediately online! Compete for the high score online against other players. Use the shared user community 'dictionary editor' to create new content which everyone can use to help them make their own games. New entries you share with the community are available for everyone to use as soon as you make them! Click the Factory Polluter Game pictures to create your own Factory Polluter style games or to play Factory Polluter style games others have already made. In Factory Polluter style games the player controls a pollution belching factory. Launch giant clouds of pollution into the sky to pollute the world as fast as possible to win the game. Create your own Factory Polluter style game just by pointing and clicking to make your own unique game - and have it shared instantly so you and your friends can play it immediately online! Compete for the high score online against other players. The new Flash game creator lets you make a Flash game where you pick not only the things you practice in the game (or make your own) but you can also make the Flash game style you want by changing colors and graphics. In the new Factory Polluter Flash game creator you can make the sky blue and flocks of migrating pink dragons, change the land, pick your own factories and more! Once you make a Flash game you like, then you can use content made by others or create your own content either just for your game or to share. Make a Flash game and then play your game online immediately or email it to friends as a simple HTML link! Click the Floating Flashcards Game pictures to create your own Floating Flashcards style games or to play Floating Flashcards style games others have already made. In Floating Flashcards style games you have to whack down floating answers to questions as fast as you can to compete for the internet high score. Create your own Floating Flashcards style game just by pointing and clicking to make your own unique game - and have it shared instantly so you and your friends can play it immediately online! Compete for the high score online against other players. Click the Trivia Q&A Game pictures to create your own Trivia Q&A style games or to play Trivia Q&A style games others have already made. In Trivia Q&A style games you have to compete against the clock for bonus points to fight for the internet high score. Create your own Trivia Q&A style game just by pointing and clicking to make your own unique game - and have it shared instantly so you and your friends can play it immediately online! Compete for the high score online against other players.